Marshfield, WI (OnFocus) About half the budget for snow and ice control has been spent, thanks in part to February’s heavy snowfall. The budget for 2019 was $927,541 plus a portion of the parking facilities budget of $79,150, for a total of $1,006,691. Through February, nearly half of the snow and ice budget has been spent, a total of $479,262. However, this amount will be higher once contractor bills are processed. “January was good, but February saw multiple snow events. Not knowing what the rest of this winter will bring, or the first portion (November-December) of the 2019-2020 winter, I expect an overage that would need to be covered,” said City Administrator Steve Barg. The snow and ice control budget is an estimate of costs based on an average year. This is separate from the street budget. 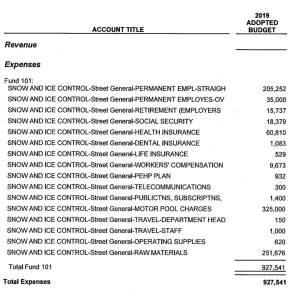 If the City was to go over-budget on snow and ice control, the amount can be covered through surpluses in other areas. “Overages that may occur in spending on snow/ice control can often be covered through overall budget surpluses that we often experience, or they are otherwise handled through adjustments made with general fund reserve monies,” said Barg. A Street Division compensatory time pilot program approved by the Common Council would allow Street Division staff to choose more time off in the future instead of the City paying overtime, a move which may produce considerable savings. Employees can accrue up to 80 hours (formerly 40) of compensatory time and use that time over the next 6 months. “In recent years, I have tried hard to hold constant or reduce the budget for snow/ice control. Since we often have an overall budget surplus at year-end, it’s hoped that this can be used to cover any shortfall in snow/ice control costs,” said Barg.